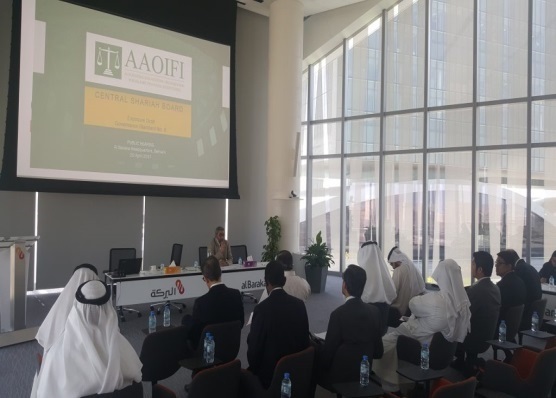 Public Hearing was held on 27 April 2017 by Accounting and Auditing Organization for Islamic Financial Institutions - AAOIFI) for introduction and development standards (External Shari'ah Audit and Central Shari'ah Board), which are of great importance for the Islamic Finance Industry. AAOIFI, established in 1991 and based in Bahrain, is the leading international not-for-profit organization primarily responsible for development and issuance of standards for the global Islamic finance industry. Amongst its most remarkable achievements is the issuance of 94 standards, so far, in the areas of Shari’ah, accounting, auditing, ethics and governance. Its standards are adopted by central banks and regulatory authorities in a number of countries, either on a mandatory basis or as basis of guidelines. AAOIFI has great importance in the Islamic Finance area with their standards. Since the integration of the international interest-free finance system is important for the sustainability of the system, differentiated applications can have a detrimental effect on the development of the system. International standards for advisory boards have been developed to solve these problems. For this reason, the External Shari'ah Audit and the Central Shari'ah Board standards (prepared by AAOIFI) are of great importance in terms of Islamic Finance. The distinguished group of jurists, experts, bankers, professors, professionals, regulators, among others attended this public hearing in Istanbul.